Maria believes in the Goddess. It is her democratic right. Her faith it is The Temple of Her Hallowed Self. no partners; never mangled, she. No siblings. No uncle. No aunt. is but One. No Thou or Thee. No child. dusts around a stamen's sticky tip. each uniquely coded, mosaic blueprints for our destiny. violating us in raging optic fibres. configured, predestined for one place. insects' scribblings on the Scribbly Bark. 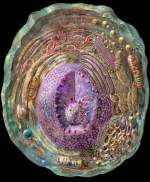 embryonic cells, fuel cells, germ cells. and evil networks. Some spiritual awakening. Molecules of isms saturating insanity. is our hero, much revered today. disposable man, the medical Savior of our 21st century. Long live our free world of mice and men! Women! Yeah! But how then can we talk of freedom? Does anyone know true liberty? And the beat goes on. New units daily manifest. now feelings, present thoughts. Many old cells disappear. our judgments, shifting in each instant. Rejection to Acceptance. Destruction to Renewal. War to Peace. Life to Death. Endings and Beginnings. E m a n c i p a t i o n.
exist in the same body again, nor hold identical mind. Such is the sanctity, the miracle of life.